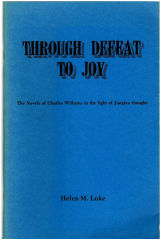 In his essay 'On Stories' published in Essays Presented to Charles Williams, C.S. Lewis speaks of the neglect of Story in the modern world, and defines it as a form of literature in which 'everything is there for the sake of the story'. The novels of Charles Williams are of this kind. The stories they tell are largely concerned with the relationships of men and women to the archetypal powers behind human life, and, like all real stories, they are about individual choices and the interaction of those choices with the operation of fate. These early collections of essays by Helen Luke are the result of reflections which were originally the material for discussion groups held at Apple Farm Community.